At Flooring America of Oregon in Oregon City, we carry a wide variety of hardwood flooring finishes, colors, and styles for your home. Whether you need oak hardwood flooring for your traditional living room or are seeking the elegant feel of Brazilian cherry hardwood floors, our hardwood floors are as unique as your own personal style. We offer the best manufacturer name brands in the business in our expansive showroom including floors from Bruce Hardwood. Portland homes increase in both value and appeal with the beautiful, natural look brought on by these styles. Solid hardwood floors can instantly update any room in your Portland, OR, home. 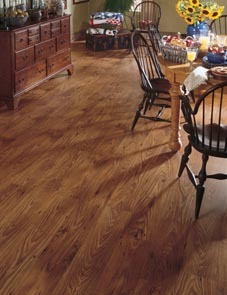 The timeless appeal of hard wood floors makes a great investment and increases the value of your home immediately. With easy maintenance, your hardwood floor will look great for many years to come. Our hardwood flooring prices continue to be the best in the industry due to the large buying power of our Flooring America network of stores. From the stunning look of hickory to the distinct look of maple hardwood flooring, we have the hardwood flooring you need at a price you won't believe. In addition to their enviable appearance, hardwood floors provide a variety of benefits. Since wood floors are so easy to maintain, they can help improve your home's indoor air quality and minimize the effects of dust and pet dander for those who suffer from allergies. Engineered hardwood flooring is a smart alternative for areas in your home that need additional protection against water and moisture. Engineered hardwood floors are ideal for basements, dining rooms, and foyers. Ask our experienced flooring professionals more about the engineered wood flooring that you need to complete your space. From exotic hardwood flooring to the latest styles from Bruce hardwood flooring, we have what you need at Flooring America of Oregon. Visit us today to find out how we can add style and value to your space with our prefinished hardwood. Portland homeowners can explore more hardwood selections online by checking out the hardwood catalog by Flooring America of Oregon.